(Bloomberg) – Former Zimbabwean Finance Minister Tendai Biti, a leader of the country’s main opposition alliance, was arrested in neighbouring Zambia where he plans to seek asylum, his lawyer said. It’s unclear what Biti has been charged with, Nqobizitha Mlilo said by phone from the Chirundu border post in northern Zimbabwe. Biti fled the country because his life is in danger, Mlilo said in an interview broadcast on state television in South Africa. 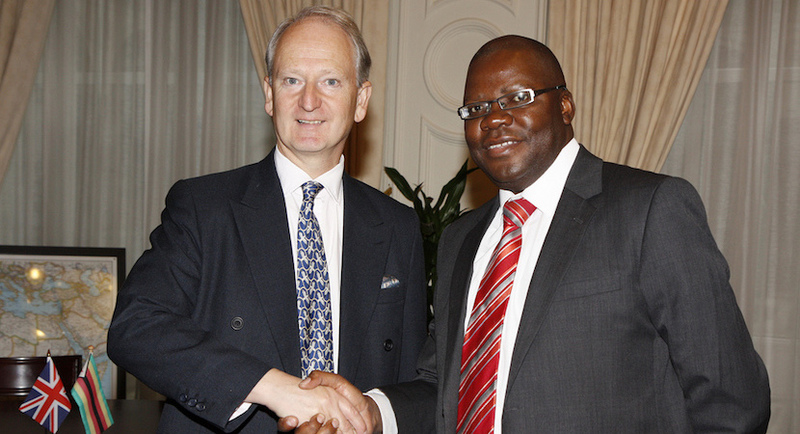 Former Foreign Office Minister Henry Bellingham meeting Tendai Biti, Former Zimbabwean Minister of Finance in London, 29 September 2010. Biti is among opposition leaders who have questioned the outcome of last week’s presidential elections, in which the ruling Zimbabwe African National Union-Patriotic Front won a constitutional majority and its leader, Emmerson Mnangagwa, was elected president. The Movement for Democratic Change, a seven-party alliance led by Nelson Chamisa, plans to announce on Wednesday how it plans to challenge the vote results. Biti, 51, was finance minister in a unity government formed in 2009, after a disputed 2008 vote, in which Zanu-PF shared power with the MDC. He split from the MDC after it was defeated in another contested vote in 2013, before reuniting with the alliance last year. “He has always been an agent of peace who seeks to have a change in the political regime in Zimbabwe,” Mlilo said. (Bloomberg) – A senior Zimbabwean opposition figure who sought political asylum in Zambia was handed back to authorities in his home country as a Zambian court order staying the decision to return him came too late. Tendai Biti, a former finance minister, attempted to cross to neighbouring Zambia earlier this week, claiming the July 30 vote in his home country was rigged. Zambian authorities subsequently detained Biti and eventually heeded the Zimbabwean government’s call for his return. “We will not be used as a country for those who want to run away from court to appear on charges,” said Zambian Information Minister Dora Siliya. There’s no breakdown in law and order in Zimbabwe and citizens’ lives are not in danger to warrant Biti’s asylum bid, she said. A Zambian court stayed the government’s decision to return Biti, but it was after he was returned, according to Siliya. Court documents from the order cited six national laws and a regional protocol as reasons for granting Biti a Zambian court appearance. Zimbabwean police say he’s wanted for breaking electoral laws. Biti, 51, was Zimbabwe’s finance minister between 2009 and 2013 when former President Robert Mugabe’s ruling party shared power with his political opponents after a disputed election that was marred by violence. Last month’s first post-Mugabe-era vote, in which President Emmerson Mnangagwa was declared the winner, has also seen turmoil and the opposition Movement for Democratic Change claiming victory. Biti, who leads the opposition People’s Democratic Party in an alliance with the MDC, tried to cross into Zambia Wednesday at a northern Zimbabwe border post.